Isobel Roser in Editor's Picks History on 17 September, 2016. Tudor fashion and image-making has long provided a source of fruitful discussion for historians and enthusiasts alike. However the recent discovery of remnants of an Elizabethan dress, which could potentially have links to Elizabeth I herself, has propelled the subject firmly into the limelight. Elizabeth is often portrayed as a master of self-presentation, but her use of the royal wardrobe as a means of securing loyalty and preserving relationships has seen less discussion. This new discovery provides an ideal opportunity to explore these issues further and tease out the multi-faceted nature of royal fashion during the Tudor age. The fragment in question was discovered earlier this year, in a rural church located in the small village of Bacton in Herefordshire. For centuries the material was preserved as an altar cloth, although the particularly rich and intricate decoration of the fabric remained a source of uncertainty. A local woman named Blanche Parry, who rose to the position of Elizabeth’s ‘Chief Gentlewoman of the Bedchamber’, is believed to have been gifted with the material in recognition of her lifelong service to the crown. While the altar cloth has long been associated with Parry, its origins as a high-status Tudor court dress have only recently been confirmed. The speculation regarding Elizabeth’s ownership of the dress has been intensified by knowledge of Parry’s close personal relationship with the Queen. Similarities have also been drawn between the altar cloth and a dress worn by Elizabeth in ‘The Rainbow Portrait’, providing further evidence to suggest that this dress indeed belonged to the Queen herself. While we should not jump to conclusions about this remarkable find, if such speculation is correct, this could be a discovery of huge significance for historians of the Tudors and Elizabeth I. It not only offers a rare glimpse inside Elizabeth’s magnificent wardrobe, but also provides an insight into how the Queen valued and rewarded loyalty. It prompts us to ask new questions about Tudor attitudes towards fashion, and reassess their relationship with clothing. The Tudor age saw a real evolution in the use of fashion as a royal political tool, with a particular sea change being felt during the reign of Henry VIII. Not only did the range of colours and materials broaden during the Henrician regime, but the understanding of the power of clothing and the King’s physical presence became ever more sophisticated, partly as a consequence of the break with Rome. Henry and his advisors were acutely aware that public confidence in the King’s masculinity and virility could be fortified through clever use of apparel. Hans Holbein’s iconic full length depiction of Henry VIII drips with masculinity; enormous sleeves help broaden the King’s shoulders, while a bulging codpiece makes a clear statement about the fertility of the Henrician dynasty. 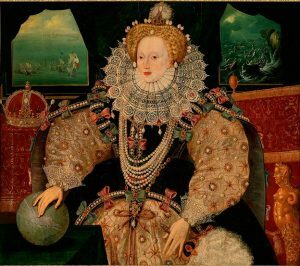 Elizabeth I was equally aware of the power of clothing to shape and define a dynasty. Much like her father, she often used a broad-shouldered silhouette to create a sense of her monarchical strength. She relied on wide sleeves to create this illusion, as seen in ‘The Armada Portrait’. 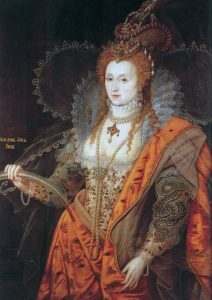 Allegory and symbolism are also frequently found within Elizabeth’s garments; a further technique within her arsenal of apparel. Pearls, representing purity, were commonly used to embellish her dresses and were also worn as jewellery. Moreover Elizabeth commonly relied upon the imperial crown as a regal emblem of her far-reaching powers as Queen of England. Extensive records and accounts tell us that the royal wardrobe was a very busy part of the royal household, with high-quality materials being sourced and new garments ordered regularly throughout the Early Modern period. Due to the lengthy, complex process of clothing production it was a working body as much as a physical space. Elizabeth’s inclination towards extravagance and her desire to keep up with fashions on the continent meant that the royal wardrobe was busier than ever during her reign. The discovery of Parry’s gifted dress material appears to indicate that clothing was seen as somewhat disposable among the upper echelons of society and was open to be reused by others. This is unsurprising when we consider that rich, valuable materials were often repurposed at this time once the particular garments had outlived their usefulness. This was fashion recycling at its best. Fashions and trends often acted as a means of displaying fealty and allegiance within the highly-charged atmosphere of the court. For example, it has been speculated that a woman’s factional allegiance for Catherine of Aragon or Anne Boleyn could be identified through the style of hood she wore to court. More subtle means of securing loyalty and building relationships through clothing are noticeable during the Elizabethan period. It would be wrong to suspect that Parry’s gift from the Queen was an isolated case; it seems likely that Elizabeth regularly offered her old garments to those closest to her. This would have created quite an intimate relationship between the Queen and the recipient, enhancing personal connections and further securing their loyalty. Given the relative insecurity of a female monarchical power in this time period, preserving these personal relationships was of particular importance to Elizabeth. We cannot underestimate the importance of fashion for monarchs and their courtiers during the Tudor period. Henry VIII’s accession, and more specifically the break with Rome, marked a real transition in the significance placed on the image of the monarch and their physical person. As Head of the Church of England, the monarch had more power than ever before; something they had to embody within the clothes they were wearing. Fashions and lavish materials had the power to make political statements, as well as building close personal bonds and relationships. The Tudors not only dressed to impress, they dressed with an acute political awareness.